Aggressive Rahul Gandhi not letting go of Rafale pressure. Sharpening his attacks on PM Modi over the Rafale deal, Congress president Rahul Gandhi on Friday reiterated that the PM was a “thief.” Prime Minister is guilty in Rafale deal, the Congress president declared. 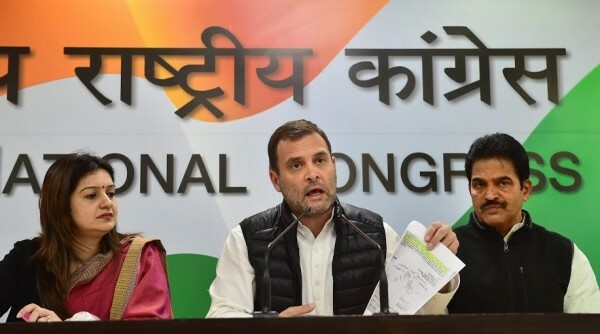 Addressing a press conference at the Congress headquarters, Rahul Gandhi referred a news report published in The Hindu and said it was crystal clear that PM Modi is guilty in the Rafale deal.“PM Modi himself robbed Air Force of Rs 30,000 crore and gave it to Anil Ambani, we have been raising this since one year. Now a report has come where Defence Ministry officials say that the PMO was holding parallel negotiations with the French government,” emphasised Rahul. Training guns at Modi and the Raksha Mantri, Nirmala Sitharaman, for lying to the nation as well as to the Supreme Court, the Congress president asserted that Modi was involved in the Rafale scam. Rahul said Modi held parallel talks with France, undermining the standard procedure, seeking his reply over the deal. “Yesterday, Mr Modi gave a lengthy sermon, why doesn’t he answer these questions? Why doesn’t he state the reason for parallel negotiations?” added Rahul Gandhi. Quoting an internal note of the Defence Secretary dated November 24, The Hindu claimed, the defence ministry secretary protested the PMO’s intervention in Rafale deal. The MoD under Manohar Parrikar was of view that PMO intervention undermined the Rafale negotiations. “It is desirable that such discussions be avoided by the PMO as it undermines our negotiating position seriously,” read the note published in the report. This came after the PM’s ‘Rafale’ attack, and Gandhi called the forces his pride, in a press conference. Rahul alleged it’s now in black and white that the PM bypassed the negotiation process and weakened the negotiations of the Indian team in Rafale. “I want to tell the generals of the Air Force that the PM has stolen Rs 30,000 crore, he’s a thief, I don’t want to use strong words but I’m forced to use these. I cannot think of a better word. The truth is that the PM is a thief,” Rahul kept repeating. Holding up the documents quoted in the newspaper, he said the Defence Ministry was clearly objecting to the interference. Gandhi also read out from a 2015 note, purportedly from the Defence Ministry, published in the newspaper. “Now, it is crystal clear that the ministry itself has said, and I will read it to you, ‘It is, therefore, clear that the parallel discussions by the PMO has weakened the negotiation of the MOD and the Indian negotiating team. We may advise PMO that any officers who are not part of the negotiation team may refrain from having parallel parleys with the officer of the French government’,” Gandhi said. The Congress president also reiterated his demand for a joint parliamentary committee to probe the Rafale deal. Meanwhile, the former defence secretary G. Mohan kumar — during whose tenure the Rafale deal was finalised – gave a clean chit to the PMO saying that the deal was a clean one and that the Prime Minister’s Office (PMO) had no role in it. Mohankumar said this to Mathrubhumi TV channel on Friday in Kochi after the English daily came out with his file notings and the Congress-led opposition took it up in the Lok Sabha during the day. Mohan kumar, who hails from Kerala, said when a deal of this nature takes place between two countries, there is nothing wrong even if the PMs of involved countries speak on it.